Emma Stone and SNL put together a great skit on the nativity and how un-glamorous it must have actually been to have a baby in a barn. One of the most characteristic songs of the Christmas season is Joy to the World. It’s sung by carolers and played in instrumental pieces all over the world, and wherever its famous tune rings, it sets the tone of Christmas. Except… this quintessential Christmas hymn isn’t actually about Christmas. Written by Isaac Watts and first published in 1719, Joy to the World was a hymn Watts wrote based on Psalm 98, which describes the eternal kingdom which God promised to one day bring about via the Messiah. Watts, in writing this hymn, considered Psalm 98 along with the New Testament writings about Jesus’ second coming, and wrote this song – which is all about what the world will be like when Jesus comes again. In this sense, we can say that Joy to the World is an Advent hymn, even if it is not necessarily a Christmas hymn. We look BACK to Jesus’ first coming and the incarnation (Christmas) – that act in which God took on human flesh in order to save us. We look FORWARD to Jesus’ second coming, when he will come again according to his promise, to judge the nations and rule over his eternal kingdom. And so it is in this latter sense that Joy to the World is absolutely an Advent hymn, as it looks forward to the second coming of Christ, when nature will sing and Jesus will rule as King over all. Another thing you may not know about the hymn Joy to the World is that it was originally set to a different tune than the iconic one that we associate with it today. Over 100 years after Isaac Watts originally wrote the song, a composer named Lowell Mason, inspired by Handel’s Messiah, wrote the melody which we know today. He titled this musical piece Antioch, but it didn’t have any words to go with it. For three years Mason searched for the right words to fit his melody, finally settling on Isaac Watts’ lyrics for Joy to the World, and the rest is history. This Advent at White Fields Church in Longmont we are doing a series for the month of December, including Christmas Eve, called Joy to the World, in which we will be looking at how the gospel brings lasting, powerful joy into our lives which overcomes sorrow and cannot be taken away. Yesterday was our first message in that series, which came from the Gospel of John chapter 16 and was titled “Your Sorrow Will Turn Into Joy.” For the audio of that message, click here. We’d love to have you and your friends and family join us at White Fields this Advent and on Christmas Eve. Our services will be at 4:30 & 6:00pm at the St. Vrain Memorial Building at 700 Longs Peak Avenue in Longmont, Colorado. For more information and directions, click here. One of the ways you can tell it’s Christmastime is because of the music. However, not all Christmas music is created equal. She had heard the song on the kids album and was understandably concerned, because, as a child, she didn’t understand the basic premise of the song which makes it cute and fun: that “Santa” is actually the kid’s dad dressed up in a Santa outfit, and the kissing is therefore completely appropriate. Without that piece of the puzzle, this song is quite confusing and disturbing! Think about it: it’s the story of a young child, excited about Christmas, who comes out of his room late at night to discover that his mom is making out with Santa! How incredibly traumatic! Not only is his mother being unfaithful to his father, but on Christmas?! And with Santa?! Talk about disillusionment! Where’s dad? And Mom is seriously doing this behind dad’s back, in his own house?! 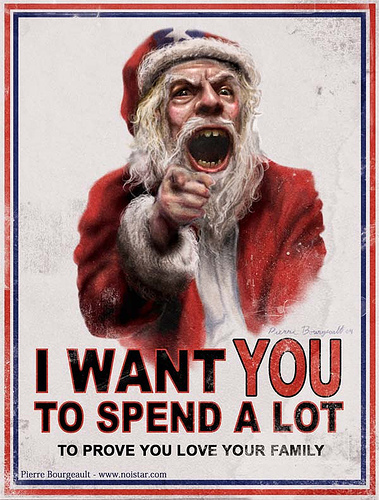 And Santa… he’s a monster who is ripping apart our family! You can keep the presents Santa; I just want my family back, and I want mom to stop doing things like this to dad! Furthermore, if Santa apparently “sees you when you’re sleeping” and “sees when you’re awake”, and “he knows if you’ve been bad or good” — and he keeps a list of who’s been naughty and who’s been nice… well then that means that Santa knew that Rudolf was getting bullied, but he didn’t do anything about it! There are some really good Christmas songs out there though; songs written by people for whom the Christmas message completely changed their lives and transformed them at their very core, and there is nothing they can do to stop themselves from erupting in song as a result of it. They say things like: Joy to the World, the Lord has Come! Joy to the World, the Savior reigns! No more will sins and sorrows grow, nor thorns infest the ground: he comes to make his blessings flow – as far as the curse is found! They sang rich theology and wonderful truths: Veiled in flesh the Godhead see, Hail the incarnate Deity! Born that man no more may die! — Born to raise the sons of Earth, Born to give us second birth! That’s a song written by somebody who had something to sing about! The very first Christmas carol was sung by Mary, the mother of Jesus, and it is known as “The Magnificat” because it begins with the words: My soul magnifies the Lord. The occasion for this song was the Annunciation: the announcement to Mary that she was going to have a baby, who would be the long-awaited Savior of the World. It was Mary’s response to the news that for a reason based only on God’s sovereign choice, God had chosen to place his favor on her and chose her to be the one to bear, to care for, to raise the Messiah… Jesus. In this song, Mary sings about God’s attributes, God’s purposes in history, and God’s incredible work of opposing the proud but exalting the humble. May we humble ourselves before Him today, see what He has done for us, and receive His grace: the unmerited favor which He has shown us. Then you’ll really have something to sing about this Christmas! December 6 is the feast day of St. Nicholas. Particularly in Europe, it is celebrated as St. Nicholas Day, and the tradition is to put chocolate and gifts into the children’s shoes for them to find in the morning – a tradition that my wife keeps in our home. I don’t know if you’ve met them or not, but there are some Christians who think that Santa Claus is evil and that he takes away from the true meaning of Christmas. Not to mention, some would point out, that Santa is nothing more than a misspelling of SATAN, which must be why he goes around in those obnoxious red clothes: because he is from HELL and wants to take you and your kids back there with him! This of course, is based on a sad lack of knowledge regarding the origin of Santa Claus – the name (in English) being simply a direct derivative of “Saint Nicholas”. For this reason, some Christians protest anything to do with Santa Claus, and tell their kids that Santa is not real, he is bad, and he takes away from the true meaning of Christmas, which of course is Jesus. This Christmas season, as we do every year, we will tell our kids the story of the real Saint Nicholas – who was not a mythical fat man in red clothes who rode through the skies on a sleigh pulled by flying reindeer, but a devout Christian man, a pastor, who was persecuted for his faith, and gained fame because of his generosity to the poor and needy. We don’t avoid Santa Claus – we don’t even want to. We see it as a great opportunity to teach our kids about a great Christian man who loved Jesus and was generous and kind because of the love of God which was in his heart. THAT is the “Christmas spirit”. We tell our kids that there are many people in the world who want to follow the example of Saint Nicholas, and that is why they will meet a Santa at their school and at the mall – and some of them will have very fake beards, because none of them are the real Saint Nick. We also teach our kids that, as Christians, we want to be like Saint Nicholas too, and we are going to be generous to the poor and needy too because God loved us so much that he gave us his Son, Jesus, so that we could have eternal life and have a relationship with God. The real Saint Nicholas was born in the 3rd century in the village of Patara, in what is now southern Turkey, into a wealthy family. That’s right – no North Pole and reindeer for the real Santa, but palm trees and white sand beaches. His parents died when he was young, and he was taken in and raised by a local priest. Following Jesus’ call to the Rich Young Ruler (Mark 10:21) to “sell what you own and give the money to the poor”, Nicholas dedicated to use his entire inheritance to assist the sick, needy and suffering. He became a pastor, and was later made Bishop of Myra. He became famous for his generosity and love for children. Nicholas suffered persecution and imprisonment for his Christian faith during the Great Persecution (303-311) under Roman emperor Diocletian. As a bishop, he attended the Council of Nicaea (325), at which he affirmed the doctrine of the deity of Christ against the Arian heresy. Nicholas died in 343 in Myra. 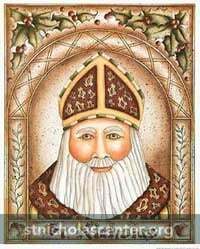 The anniversary of his death became a day of celebration, the Feast of St. Nicholas, December 6th. 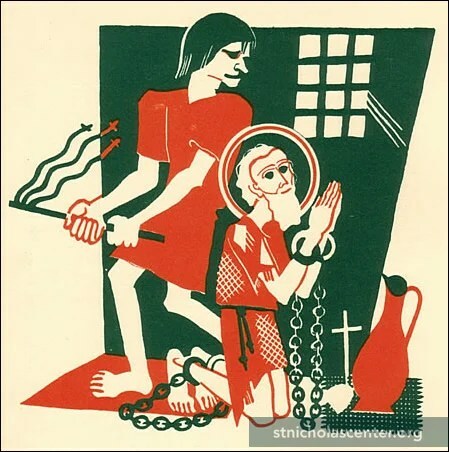 Many stories are told about St. Nicholas’ life and deeds. Perhaps the most famous story is one of a poor man who had three daughters who were of marrying age. Because the man was poor, he was unable to provide a dowry for his daughters, which meant that they would not be able to find a descent husband, and would either be married into further poverty or would have to become slaves. After Nicholas found out about this family’s situation, he visited the family’s house, leaving them 3 anonymous gifts – each time a bag of gold, which was tossed through an open window while the family was sleeping. Legend has it that the gold fell into their shoes, the reason for the tradition in Europe that St. Nicholas leaves gifts in children’s shoes. Nicholas provided for these poor girls to help them break out of the cycle of poverty. My favorite story about Nicholas is what he did at the the Council of Nicaea, where bishops from all over the world gathered to study the scriptures and address the major doctrinal controversies facing the church. Chief among these was Arianism, propagated by Arius, which denied the full deity of Jesus, saying instead that he was a created being – a view that is carried on today by the Jehovah’s Witnesses. The debate got very heated, and based on the study of the scriptures, Arianism was deemed heretical. Nicholas argued from the scriptures for the deity of Christian and against Arianism, and at one point got so upset with something that was said about Jesus from the other side, that he slapped an Arian. That’s my kind of Santa! Rather than trying to make Christmas Santa-free, let’s take back the true story of Saint Nicholas and take hold of this opportunity to talk about a Christian man who loved Jesus, championed good theology and exemplified Christ through compassion and generosity to the needy. How can you cope with the end of one world and the beginning of another one? Or the thought that the hurricane has become human, that fire became flesh, that life itself came to life and walked in our midst? This, he goes on to say, is what Christianity is all about. And the question for us is: how ought we to respond to such news? The answer is: Worship. That is the only appropriate response. In the Old Testament, when God appeared to the people it was often a terrifying experience. God appeared to Job in the form of a tempest (AKA “hurricane”). When God appeared to the people of Israel in the wilderness on Mt. Sinai, it was in the form of a consuming fire, essentially a fire-storm of lightning and fire on top of the mountain. The message was: God is inapproachable. To attempt to come near to Him would result in certain death… God even told Moses that if anyone would see Him in His glory, they would surely die. And yet, the incredible message of Christianity is that in the person of Jesus, “the hurricane became human,” that the “fire became flesh” and “life itself came to life and walked in our midst.” And as a result of what he did, we have the promise and the hope of the end of this corrupt world and the advent of a new and better world to come. Worship is not an optional extra for Christians, a self-indulgent religious activity. It is the basic Christian stance and the only truly human stance. He goes on to say that many people view Christianity as a being something which gives them a sense of comfort and nostalgia. This should not actually be the case if someone really understands what Christianity is about. Rather than making you feel cozy, the gospel message is one that upturns every area of your life. Take Christmas, for instance: a season of nostalgia, of carols and candles and firelight and happy children. But that misses the point completely. Christmas is not another reminder that the world is really quite a nice old place. It reminds us that the world is a shockingly bad old place, where wickedness flourishes unchecked, where children are murdered, where civilized countries make a lot of money by selling weapons to uncivilized ones so they can blow each other apart. Christmas is God lighting a candle; and you don’t light a candle in the room that’s already full of sunlight. You light a candle in the room that’s so murky that the candle, when lit, reveals just how bad things really are. The light shines in the darkness, says St. John, and the darkness has not overcome it. Christmas then, and Christianity as a whole, is not about escapism, it’s about reality. It’s about how God has intervened in our world, and as a result, everything has and will change. The only proper response to this is to worship God for all he’s worth. May we truly understand the weight of the Christian message: “the end of one world and the beginning of another” — and may we be moved towards this rhythm of response: Worship and Mission. The first Christmas sermon I ever preached was on the topic of whether Jesus was really born on December 25th. My point was that most scholars believe was that Jesus was not born on December 25th, but probably in September, because the shepherds were sleeping outside with their flocks at night, which is not something that would be done in the winter months when it was colder at night. Furthermore, this view is based on the tracking of the stars, which some say would place the North Star in the right place in the sky sometime in autumn. The first recorded date of Christmas being celebrated on December 25th was in 336AD, during the time of the Roman Emperor Constantine (the first Christian Roman Emperor). A few years later, Pope Julius I officially declared that the birth of Jesus would be celebrated on the 25th December. Prior to 336AD, December 25th was when pagans celebrated the winter solstice. Constantine took an existing holiday and changed the focus of it and the substance of what was being celebrated. It is remarkable that in the first few hundred years of the church, the main Christian holiday was Easter, when they celebrated the death and resurrection of Jesus. Christmas only began to be celebrated much later on. However, while that is all interesting information, I somewhat regret having spent the time given me during my first Christmas sermon on this topic. Having had the attention of people on that day, I wish I would not have focused on dates and details, but on the substance of what Christmas is about. You see – it doesn’t really matter what day we celebrate the birth of Jesus, what matters is the fact of the incarnation. If December 25th is the day that our culture has chosen to celebrate that, then great! I’m happy to celebrate it then or any other time! But if our whole culture is open to talking about it at this time, then what a great opportunity that is to talk about the gospel and the meaning of the incarnation on a day when more people will set foot inside a church than any other day of the year. What matters is not when the incarnation happened, but that it did indeed happen! There are some people who have a “mentality for the marginal” – a “preoccupation with the peripheral”. They focus all of their time and attention to theories about dates and details, the movement of stars and how exactly the star did lead the magi, or how exactly did the Red Sea split, or how did Jonah survive in the belly of the fish – they are concerned with gathering information on and debating peripheral matters of theology, which are tentative and have very little spiritual significance. It is not to say that such interests are bad, except when this preoccupation with the peripheral takes one away from a focus on the great central things of the gospel – the holiness of God, the terribleness of sin, the helplessness of man and the love of God; the death of Christ, the resurrection from the dead, justification by faith, the work of the Holy Spirit and the return of Christ and the final judgment. Some people are easily sidetracked from these things by the latest speculations and theories and tidbits regarding things which have little ultimate significance. What is wonderful about the Christmas story – the story of the incarnation – is that if you will allow it to, it will refocus you onto that which is important. It will help you keep the main things the main things. It re-centers us, by reminding us of the big picture: that the world is under the dark cloud of sin and death, but God, in his love, has sent us a savior: Christ the Lord, who is none other than God himself come to us in human flesh. And if anyone puts their faith in Him, they will not be put to shame, but they will be saved, justified, forgiven and redeemed, and have life everlasting.